This tour around Spooner Lake is adjacent to the North Canyon Creek tour, and beginners can easily ski both in one day. More advanced skiers may also enjoy this tour because it gives them the opportunity to kick up their heels or skate. The Spooner Lake area is a popular destination for locals and tourists alike. 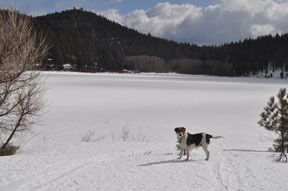 The Spooner Lake area was open to the public in winter for the price of parking up until 1985. There were even markers denoting points along the trails (roads) in the area. From the trailhead (1) ski northeast for 0.1 mile until you reach the southwest end of the dam (2). You will cross a road where the terrain levels before reaching the dam. Cross the dam to its north side and then proceed to ski 1.9 miles around the lake in a clockwise direction until you return to the dam (2). It is not safe to ski on the lake. Retrace the route for 0.1 mile back to the trailhead (1).